A Short Biography of Congressman Harley O. Staggers, Jr.
​Harley Orrin Staggers, Jr. represented West Virginia’s second congressional district in the U.S. House of Representatives from 1983 until 1993. The son of Congressman Harley O. Staggers, Sr. (who represented the second district from 1949 until his retirement in 1981) and Mary Casey Staggers, Harley Staggers, Jr. was born in Washington, DC on February 22, 1951. He attended Harvard University for undergraduate studies and received his J.D. from the West Virginia University School of Law in 1977 at which time he was admitted to the West Virginia bar. Harley Staggers, Jr. was elected to the West Virginia Senate in 1980 and served one term before announcing his candidacy for the U.S. House of Representatives in 1982. 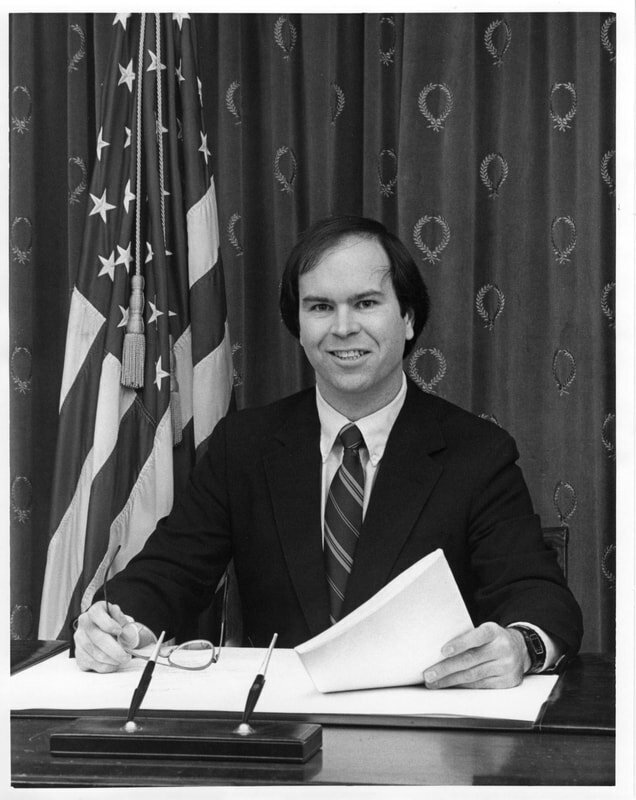 As a member of the U.S. House of Representatives, Congressman Staggers, Jr. served on the Agriculture, Veterans Affairs, and Judiciary Committees. He also served on the Select Committee on Hunger (1988-1989) and the Select Committee on Aging (1989-1993). Following the 1990 census, West Virginia’s four congressional districts were redistricted into three districts, with the new second district stretching across the center of the state. A significant portion of Congressman Staggers, Jr.’s constituents were divided into the new first and third districts, including his home town of Keyser, West Virginia. In 1992, Congressman Staggers, Jr. entered the primary for the first district and lost to incumbent Congressman Alan Mollohan. Upon leaving the U.S. House of Representatives, Congressman Staggers, Jr. returned to his law practice with his brother, Daniel. The firm of Staggers and Staggers operates offices in Keyser and Martinsburg, West Virginia. His sister, Margaret Anne Staggers served as a member of the West Virginia House of Delegates from 2007 until 2014. STAGGERS, Harley Orrin, Jr., (son of Harley Orrin Staggers), a Representative from West Virginia; born in Washington, D.C., on February 22, 1951; graduated from Keyser High School, 1969; B.A., Harvard University, 1974; J.D., West Virginia University School of Law, Morgantown, W.Va., 1977; admitted to West Virginia bar in 1977 and commenced practice as an assistant attorney general in Charleston; administrative assistant, Democratic National Convention, 1976; elected to West Virginia senate, 1980-1982; elected as a Democrat to the Ninety-eighth and to the four succeeding Congresses (January 3, 1983-January 3, 1993); unsuccessful candidate for renomination in 1992 to the One Hundred Third Congress; is a resident of Keyser, W.Va.